Appartment with 2 bedrooms (twin beds 2 x 80 cm). One room has 'en suite' a bathroom with shower, sink and toilet. A second bathroom has a bathtub, sink and toilet. 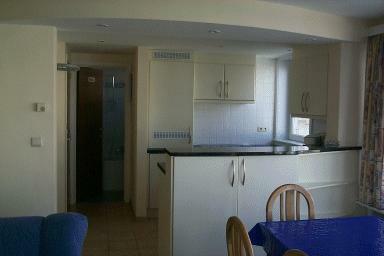 A fully equiped kitchen (also micro wave and dischwasher) and a comfortable livingroom. Television, telephone and safe are standard. There is a lift to bring you to your flat. Prices are for 4 persons, our famous breakfastbuffet and hotelservice inclusive. Our appartments are at maximum 20 meter from the hotel. If you want to stay for a longer period or do not want hotelservice, please ask for an offer on info@soleilknokke.be or on +32 (0)50 511137.